On this episode of Soundwaves, the official podcast of SLUG Magazine in Salt Lake City, Utah, we interview the six-piece folk punk band Folk Hogan about the release of their latest album, The Show. We’ll also hear tracks from the album such as “Fire Breather” and “Fate In the Fade,” discuss songs for a new album, and learn about the band’s creation. 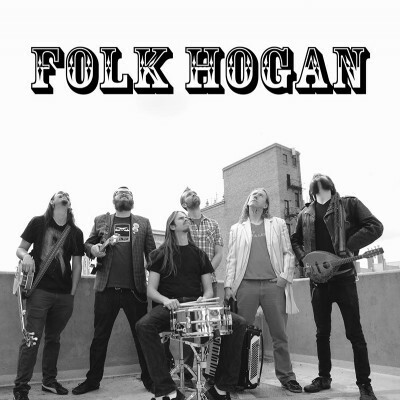 Folk Hogan was founded in the spring of 2011 with a small rotating cast of members over the years. The current lineup features Canyon Elliott on accordion, Moses McKinley on mandolin, Jared Hayes on bass, Nick Passey on guitar, J. Curtis Stahl on drums and Kameron Anton on banjo. The band’s demo, Flight Training, can be downloaded for free on their website. In 2012 the band released their debut full-length album, Band Of Mighty Souls, making several local music writer’s lists and gaining airplay on KRCL. Over the past year, the band has been hard at work writing and recording their sophomore album, The Show, which will be released April 10 at Urban Lounge with Six Feet In The Pine opening. McKinley and Elliot talk with LeAundra Jeffs about the concept behind the new album and the part each band member played in its creation. Thanks for listening to SLUG Mag Soundwaves. Send us suggestions of what you’d like to hear on the show by emailing us at soundwaves@slugmag.com, or hit us up on Twitter @SLUGSoundwaves. Next week on the show we’ll be talking to the people behind 5 Starving Artists as well as members from the band The Weekenders.